Hey. I recently researched how to make Clone Hero songs and watch some tutorials about Moonscraper. I have a song that I have done 25% of but I wanted to test how it played in Clone Hero so I exported it and put all the files I thought I would need in the folder, dragged and dropped it into Clone Hero but it didn't show up. So, I compared the files of a C3 custom song I had downloaded and converted using the tool and discorvered my song.ini file had WAY less information in and the information it had the same was in a different order. So I spliced together the missing parts and loaded up Clone Hero and it worked. I want to know how to get these full song.ini's. Maybe I need to use the C3CONToolsv398 to convert it to something once I've exported it from Moonscraper? TL;DR How do I get proper Song.ini files from Moonscraper or C3CONTools to play on Clone Hero? You just get another song.ini file and edit it to insert the data for your song. As far as I know, there isn't any relevant difference between Phase Shift's song.ini and CH's song.ini. Also, if you're using a .chart file, you can just not have a song.ini file (reminder that your .chart file must be named notes.chart). However, your song will have less metadata (no album name, for instance, if I recall correctly). So a song.ini file is better in that regard, but not essential. 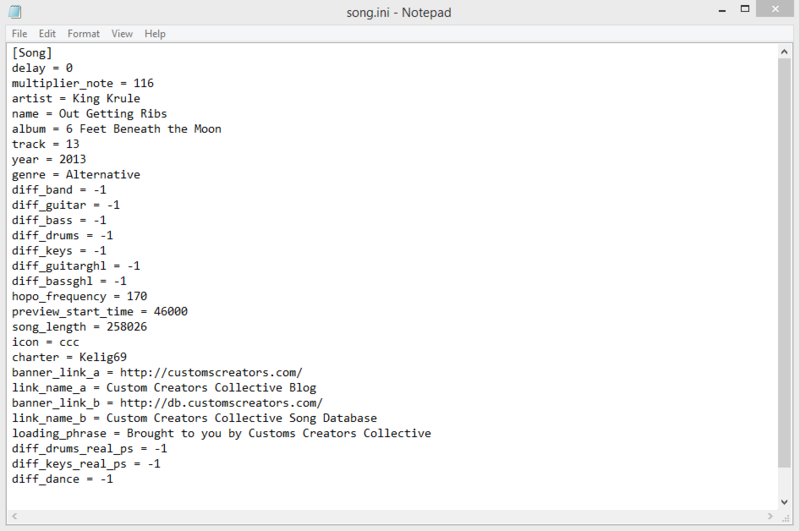 That said, apparently Moonscraper already generates a song.ini for you (judging from the "Moonscraper generated Song.ini" screenshot). If it does generate it, then you shouldn't really worry. Also, a brief reminder that (at least for now), this is a forum about Rock Band 3 customs, not Clone Hero. I don't know if you're breaking any rules (a bit too lazy to double-check, and I'll be honest, I don't really care), this is just a heads up. Clone Hero has a Discord server full of people willing to assist you (probably? maybe), so join that if you wish (the link to join it is in the game's main menu, iirc). Edit: I misunderstood your issue, sorry. 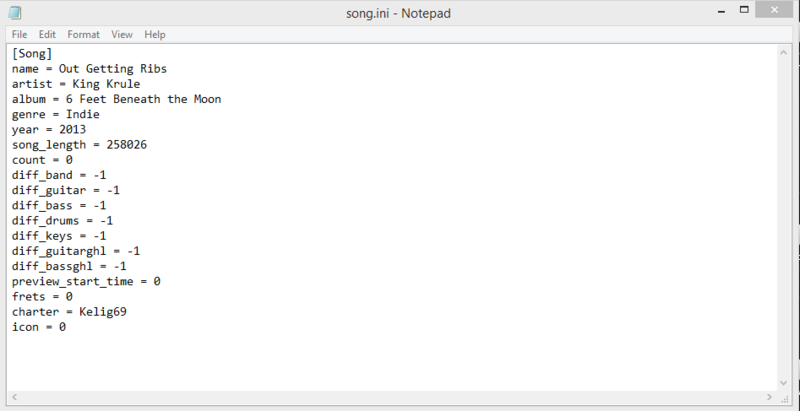 Moonscraper's autogenerated song.ini was supposed to work (CH requires way less data than PS), idk why it didn't. But the only solution I can come up with is what you did; fix it yourself, using a working song.ini file as base. AFAIK there isn't a song.ini generator (C3CON Tools converts rb3con files; it won't work on .charts and isn't a song.ini generator itself). I know there's one for Frets on Fire - a quick Google search will lead you to that - but that's probably outdated, so I wouldn't recommend it. If you want something to generate song.ini files, I would suggest looking for a Phase Shift-specific song.ini generator.